I was really in the mood for shrimp tacos for dinner the other night. Jill said she didn’t care what we had for dinner as long as it included “lots of vegetables.” So, I made shrimp tacos with a lot of vegetables. 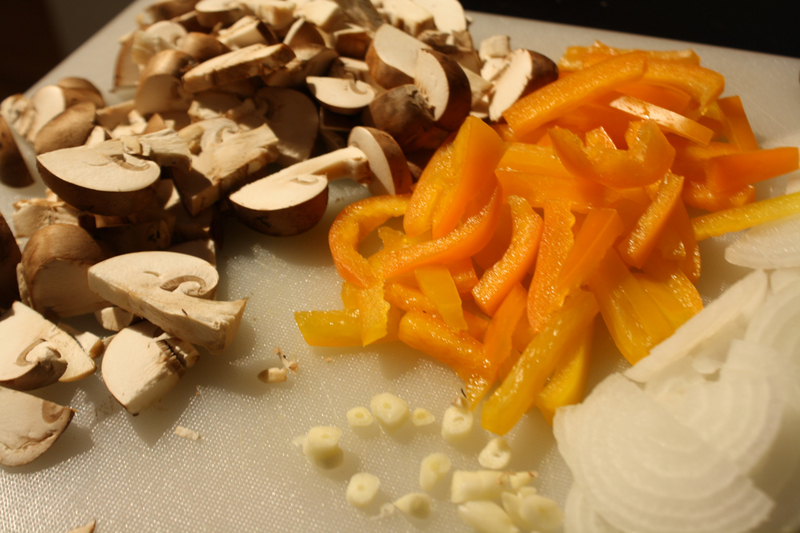 To make the shrimp tacos, or Tacos de Camarones, extra-veggieful, I quartered mushrooms, chopped some garlic, and sliced up an orange bell pepper and a small onion. 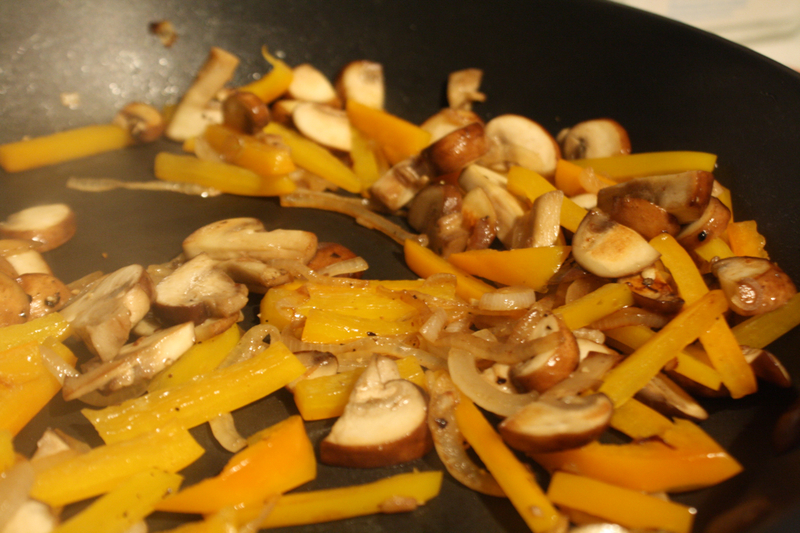 To give the vegetables a fajita flare, I sautéed them in a little olive oil until they started to caramelize. 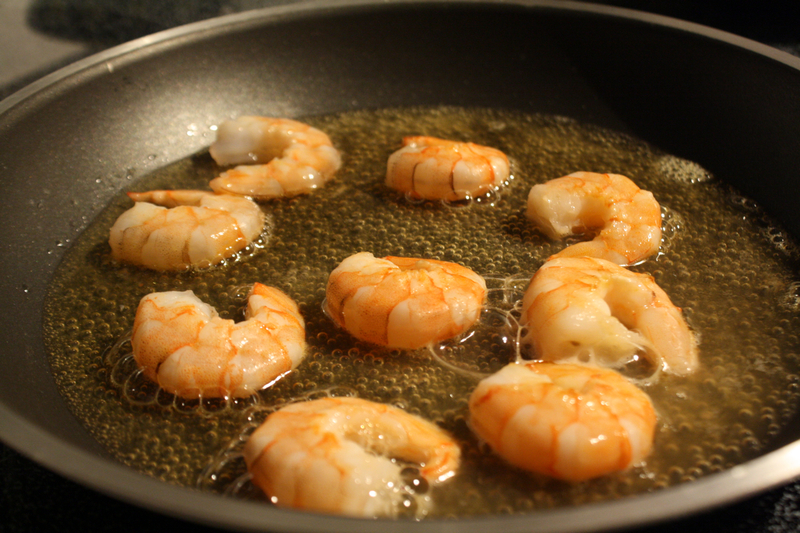 While the vegetables were sautéing, I also sautéed the shrimp in a very small amount of olive oil in a non-stick pan. 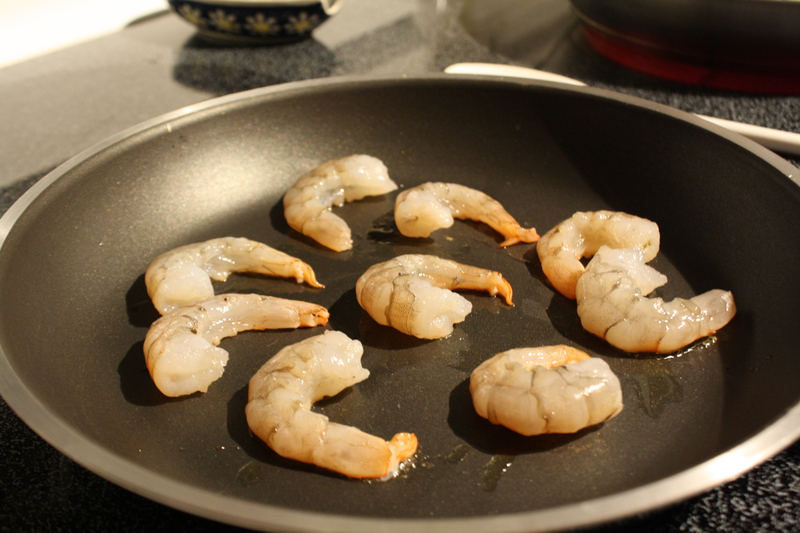 As soon as the shrimp started to turn pink, I poured in a couple of glugs of beer into the pan and simmered the shrimp until they were completely cooked. I had a bottle of Sam Adams Coastal Wheat and thought it sounded like an appropriate pairing for shrimp, so I used that. Placing two or three shrimp (depending on their size) on small corn tortillas, I topped the shrimp tacos with the vegetables. 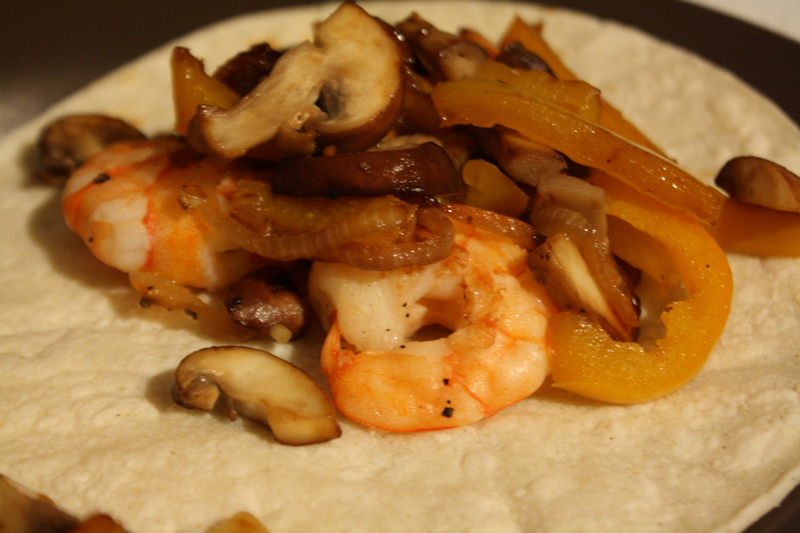 Because of the heartiness of the mushrooms, the two or three shrimp were enough to make the taco satisfying. You could always add more shrimp, but this recipe for shrimp tacos is a great way to save money and make a great dinner with only a small amount of shrimp. To add even more vegetables to the dinner, I chopped up some spinach and sliced up and avocado (Jill’s family grows avocados). 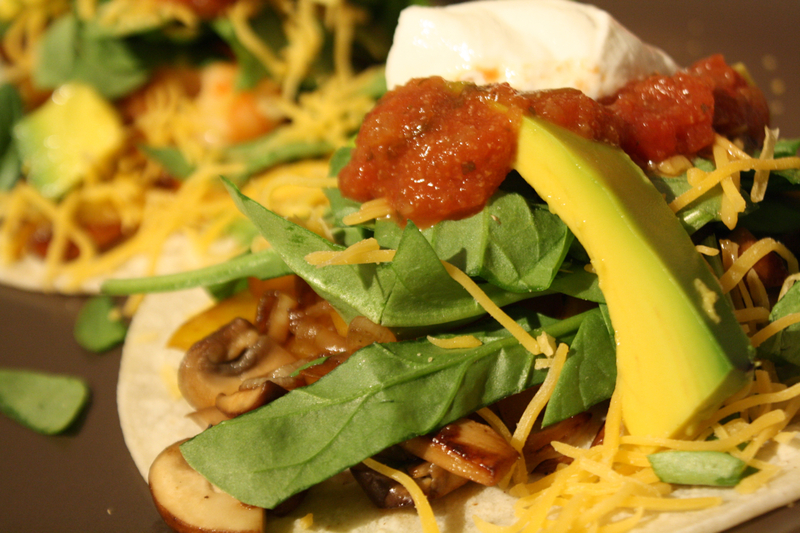 I topped the shrimp tacos with the spinach and avocado as well as with some shredded cheddar, salsa, and sour cream. The sweetness of the onions and bell pepper and the meatiness of the mushrooms supplemented the shrimp well. Because we only used a few shrimp in this recipe, we actually made this for dinner two nights in a row.